Protests in front of an embassy aren't what they seem... In the dark primal jungles of the Congo River basin, something is ravaging the local population. When protests turn violent in front of the US Embassy Kinshasa, only the foreign policy experts paid attention. Civil war erupts and people rip each other apart in the streets of the African capital. In an effort to avert disaster and preserve its self-image, an overwhelmed US Department of State dispatches a team of elite counterterrorism agents to bring their besieged people back alive. Mark Steele, a young agent within the Division, and his team of gritty operatives are used to trudging through the worst dregs that society has to offer, all while operating from the shadows. But Steele's team is wading headfirst into a maelstrom of death so much worse than rebels in the streets. A highly contagious microbe is spreading unchecked through the streets killing everyone in its wake only to bring them back again as the ravenous undead. Only a lone CDC virologist understands the extent of the outbreak at hand. He cowers amongst the embassy staff praying for extraction from the hands of death, fearing his part to play in the epidemic. Follow this harrowing tale of survival, duty, love and horror as the living dead bring the world to its knees. 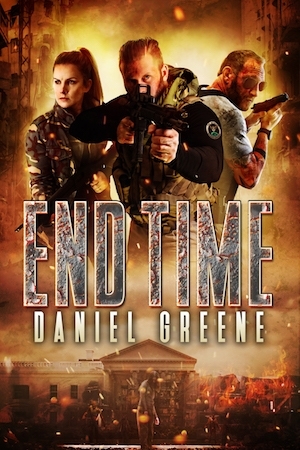 The first installment of an epic series, End Time starts as a slow burn that turns into a breakneck paced struggle for survival. Greene does an excellent job of depicting individual stories within the larger scope of the global epidemic. Enter the End Time.